FINDING ways to give your kitchen a much-needed makeover can be as painstaking as it can be exciting. For many people there’s no glossing over the fact that the wow factor they seek is in the shine – and we at Crest Timber Products certainly scrub up well on that front! Gloss doors and drawers can offer ‘pizzazz’ to any style of kitchen. For those who choose to adorn their abode with a flamboyant sheen, then the dazzle and verve generated by a gloss finish provides a sleek, designer-like look to what is, in essence, the heart of any home – the kitchen. Given the right mix of colours and textures, the energy and vitality that arises from such a lustrous appearance is palpable. Aside from the obvious style, there’s an important practical element attached to gloss doors – they are extremely easy to clean. A wet sponge and tea towel should suffice to prevent streaky marks appearing, and they are very hard wearing, meaning accidental knocks and bumps are easily withstood. Removing those unwanted sticky substances from gloss doors is a piece of cake too, while the possibility of unsightly scratch marks is dramatically reduced. For families with young children, that can only be a boon. When it comes to a good spring clean, applying sugar soap to your prized assets is just the job. Follow it up with a good buffing and your door fronts will look stunning. Window spray and paper towel in tandem does the trick too. How about another welcome offshoot to your gloss kitchen doors? There’s undoubtedly a feel-good factor that arises from the shiny approach, as the sun’s rays bounce off each of the frontages, creating an atmosphere of light and wellbeing. 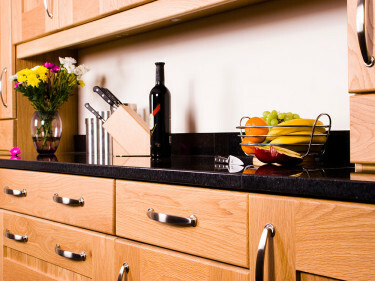 If it’s an ultra-modern effect you’re after, a gloss range of doors and drawers should be just up your alley, whether you opt for lighter colours or high-impact black. They provide a stunning designer look without the expense of designer prices. Proof that you don’t have to fork out a fortune for a modern kitchen is in the pudding – why not get in touch with us today on 01179 552622, or email sales@crest-timber.co.uk to find out?